MOMO is a simple four-letter name using just two unique letters from the Alphabet. For enthusiasts of racing and performance cars, the uncomplicated name is attached to an Italian auto accessories brand flattering some fantastic creations since 1964. Best identified for offering high-qualify steering wheels, the MOMO brand has expanded to be offered on custom pedals, alloy wheels and lights for cars. The reputation of MOMO is so great that car companies such as Rolls-Royce, Honda, Mazda and Subaru have relied on the Italian-based accessory manufacturer to provide factory equipment. 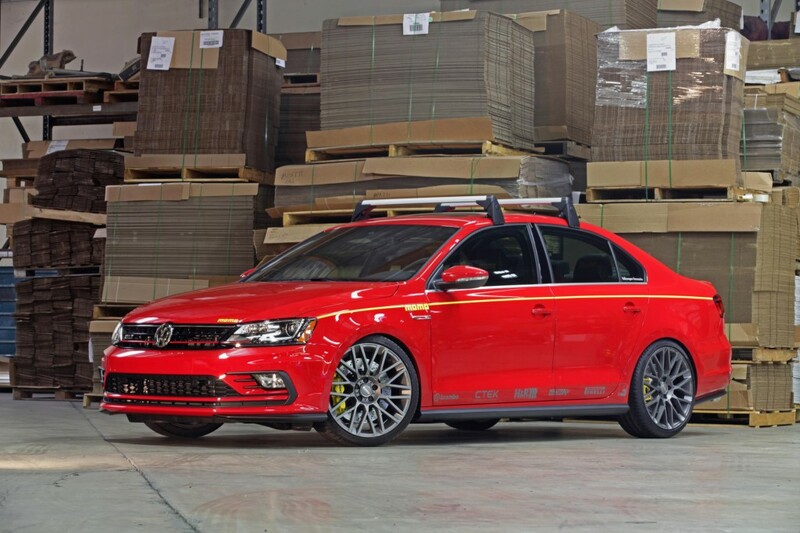 Having entered into its second half-century period, MOMO prepared a special Volkswagen Jetta GLI to showcase their famed accessories at the 2015 SEMA Show. 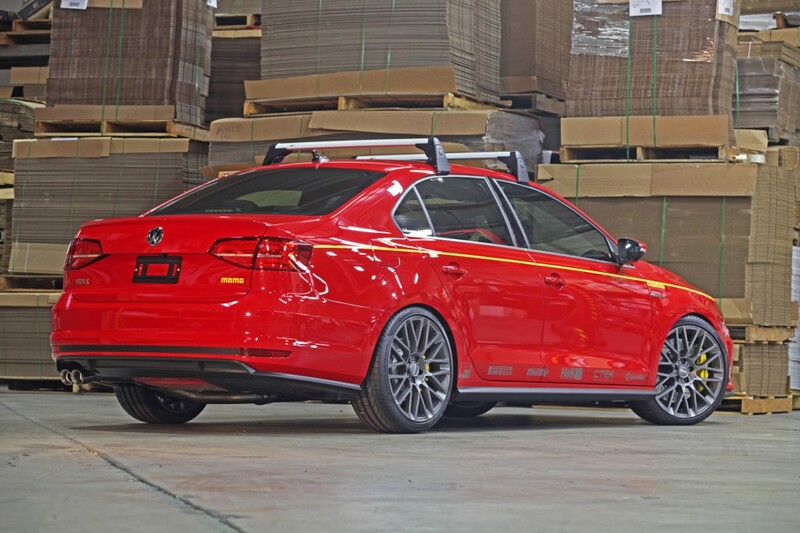 Debuting at the 2015 show in Las Vegas, the MOMO Edition 2016 Volkswagen Jetta GLI sedan red exterior color scheme is accompanied by a black interior each wearing yellow accents. A showcase for MOMO’s newest wares, the custom car also features a mixture of components from other industry names such as Brembo, Milltek Sport, H&R as well as Volkswagen itself. Offered as added accessories from Volkswagen are several components on this SEMA Show creation. An immediately noticeable Volkswagen Accessories item featured on the vehicle is the roof rack. A highlight to the MOMO Edition 2016 Volkswagen Jetta GLI is the company’s Revenge Wheels. Featuring a mesh wheel design, the first for the Italian automotive accessories supplier, 19-inch MOMO Revenge wheels are finished in a matte anthracite coloring. Mounted to Pirelli P Zero high-performance tires, the wheels ride with low-profile sidewalls. Tires combined with the H&R enhanced suspension, the MOMO Edition Jetta GLI is created to provide the driver with improved cornering and handling. Behind the MOMO Revenge wheels, braking added to the special Jetta GLI is provided by Brembo. 14.4-inch cross-drilled, two-piece rotors are fitted to the front with four-piston calipers while rear 12.2-inch rotors arrive courtesy of the Volkswagen Golf R.
Propelled through the 2016 Volkswagen Jetta GLI’s base turbocharged 2.0-liter powerplant, the MOMO Edition improvements gain better breathing for the engine’s 210 horsepower. Also granting the show vehicle a tailored, sporty sound, the Milltek Sport stainless steel cat-back exhaust delivers refined performance to the sport compact. Greeting passengers with seats with headrests prominently displaying the ‘MOMO’ name, the Jetta GLI’s cabin has been customized to promote yellow as a secondary color. 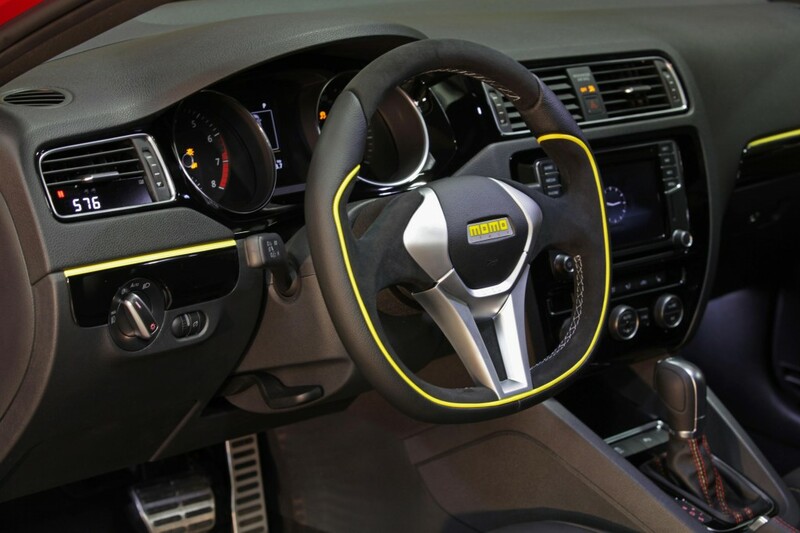 Yellow is applied through trim striping on the door panels and dashboard of the MOMO Edition Volkswagen Jetta GLI. Within the driver’s side air vent, a vehicle information display produced by P3 Cars is equipped. Largely unnoticeable when the vehicle is turned off, the digital display becomes a multifunction readout for acceleration, turbo boost, coolant temperature along with other measurements. The crowning piece of the interior is a limited edition MOMO GT50 Anniversario steering wheel guaranteed to invigorate the performance desires of anyone who touches it.